Find your local March for $15 action! From the Philadelphia march for International Women’s day on March 8th to the Seattle Action groups’ banner drops and bus speak-outs mobilizing for March 15th, the 15 Now week of action has been a tremendous success across the country with events in over 20 cities! This Saturday’s march from Judkin’s park at 1:00pm in Seattle and the actions around the country will mobilize low-wage workers, union activists, and 15 Now supporters into the streets for a show of force to escalate the national struggle. The Huffington Post has already taken notice, in an article last week, “15 Now arrives in New York” following the grassroots movement’s “overwhelming success in Washington state”. The high-profile fast food worker strike-actions last year lead to the battle for Prop 1 in Seatac, and the movement in Seattle for a $15/hr minimum wage and 15 Now’s call for a national day of action points to the need for the grassroots struggle to grow. Looking for a 15 Now action in your area? Check out the facebook links to events happening in your city, in your neighborhood, or initiate your own, and grow the fight for $15 Now across the country! March and Picket for $15/hour minimum wage from 1 pm to 3 pm on “fast food alley” starting at the corner of Lincoln and 3rd in downtown Spokane. Boston — Rally, march, and public meeting starting at 2pm at the Massachusetts State House in Boston. The public meeting at 4pm to discuss next steps for 15 Now NE. 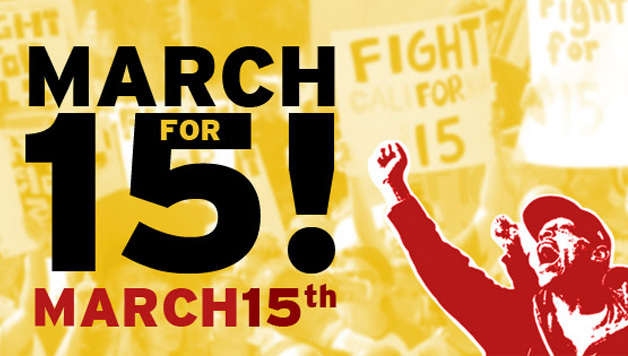 Send information about March 15th events to info@15now.org!